Call Us Today for Generator Service! Get connected with electrical services from Blackman Electric, an electrical contractor specializing in electrical wiring, power distribution, lighting system upgrade, automatic transfer switch and equipment installation for industrial and commercial applications. What separates us from any other commercial electrician in Erie, PA? Well, just about everything. 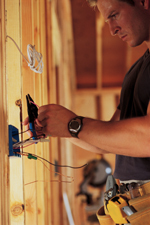 We have faster service, better prices, better resources, and some of the best electrical contractors in the area. When you need service, give us a call. We'll be there within a few days, ready to work and get you working again. And we'll do it all on schedule and within budget, so you won't have to worry about any nasty surprises. We pride ourselves not just our stellar work but on building strong, lasting relationships with our clients that are built on mutual respect and unrivaled customer service. Who do you call when the power goes out? Especially if you're a commercial business, you need to ensure that you have a quality back-up power system that you can rely on in case of emergency. The trusted name is Generac, and now Blackman offers great prices on Generac generator sales to your commercial or industrial business. Our technicians are now factory-trained to offer generator installation that you can rely on when you need it most. There's a reason that we're a trusted industrial electrician in Erie, PA and Ohio. We're the best around. Is your business looking for a reliable Industrial Electrician in the Erie, PA area? At Blackman Electric, we can handle your industrial electrical capacity up to 600 volts. We can install 5000 amp to 400 amp service. As an industrial electrician, our specialties include machinery installation at injection molding facilities, machine shops, and industrial manufacturing facilities, any type of electrical service needs for industrial warehousing facilities, and Generac Generator sales. Make your space brighter with a lighting system upgrade. Whether your business needs an electrical contractor for new construction, expansion of your current facility, or renovations of your existing structure, Blackman Electric is the firm to call, no matter what your electrical contracting needs. Whether its service upgrades, UPS installations, or lighting system upgrade, we have the experience, and the equipment, to handle the job. Does your business need parking lot lighting installed or serviced? 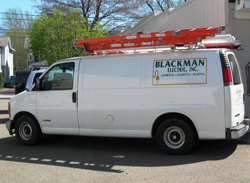 Blackman Electric has a bucket truck to complete the job quickly, efficiently and safely. If your business is expanding and needs an electrical system designed to meet your specific requirements, we have the expertise. We can upgrade your existing lighting system to energy-efficient lighting, with the potential to save you money. Whether your business is a retail shop, a restaurant, a convenience store or an office building, give us a call. We will meet with you, discuss your project and look at the site. Then, we will provide an estimate. Want to upgrade your lighting system to new, energy-efficient lighting? 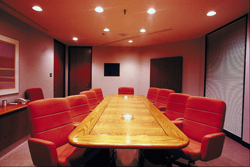 Call on Blackman Electric for assistance when you’re planning a lighting system redesign for your business. We will come out to look at the project and to discuss your needs, and then suggest the most energy-efficient and cost-effective strategies to meet your goals. We use the latest photometric software available to design the solution to your lighting needs. We can design lighting for indoor, as well as outdoor applications and landscaping lighting. We’ll help you claim any available rebates offered through the utility company, or the government, at the time of your project. Give us a call today! Our industrial electrician specializes in equipment & generator installation. Business owners know the importance of having back-up power in case the electrical power goes out. Whether your business is a machine shop, a warehouse distribution center, a restaurant, gas station or a retail shopping center – when power goes down, your Generac generator goes on - to keep things running. Depend on the factory-trained commercial electricians at Blackman Electric for Generac generator installation and generator service. Here’s how an emergency back-up generator from Generac works: When electrical power goes out, your automatic transfer switch senses the loss, and transfers the load to your Generac generator. Within minutes, your business is back up and running again! For generator service, contact Blackman Electric right away. Whether the power outage is caused by severe weather or it’s a planned outage for routine utility maintenance, losing electrical power impacts your business. Your customers, and your employees, are counting on you. And you can count on your Generac generator, and the professionals at Blackman Electric, to keep your business running. For almost twenty years, we've been setting the standard for stellar service, quality products, top-notch materials and reliable equipment installation. We've kept the business in the family that entire time, so you know that when you're dealing with us, you'll be treated like a neighbor. Our electricians are licensed, most are ranked as journeymen or higher, and they're constantly educating themselves and training so that they can provide the most innovative and cutting-edge service around. Give us a call or contact us to schedule an appointment. We'll be with you in a few short days at the most to evaluate your job, give an honest and accurate quote, and answer any questions that you might have. Blackman Electric was founded in 1960 by Stanley Brocki. Back then, we were known as Brocki Electric, and we worked as a residential and commercial electrical contracting firm all over the area. Almost forty years later, in 1996, we were incorporated as Brocki Electric, In. when current owner Frank Blackman joined as a full partner dedicated to better serve our expanding customer base. 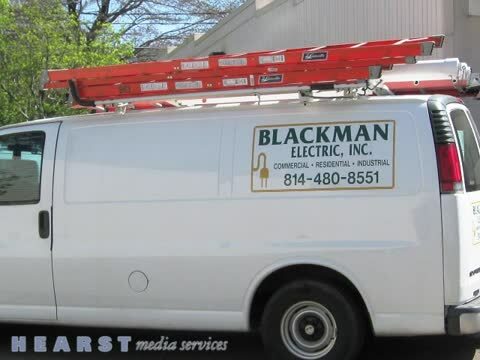 When Stan retired in late 2003, we eventually became Blackman Electric. Under the leadership of Frank Blackman, we've grown substantially in Erie, PA. With his brother Steve Blackman serving as our business manager, Frank and our crew are proud to deliver the best electrical work in the region. At Blackman Electric we pledge to provide distinctive quality and unparalleled customer service with the respect and trust of our loyal customers, suppliers and partner vendors. We are commercial electricians who can do it all! A licensed electrician with Blackman can provide generator service and installation for your Generac emergency generators, as well as service your electrical wiring. No matter if you need electrical equipment installation, power distribution service or a bucket truck, give us a call. - IEC - State Approved Apprenticeship Program - Better Business Bureau - Manufacturers and Business Association of Northwest PA (MBA) -Builders Association of Northwest Pa.